SMUD and the CDFW have teamed up to stock 6,250 pounds of rainbow trout like these fish in Loon Lake this summer. 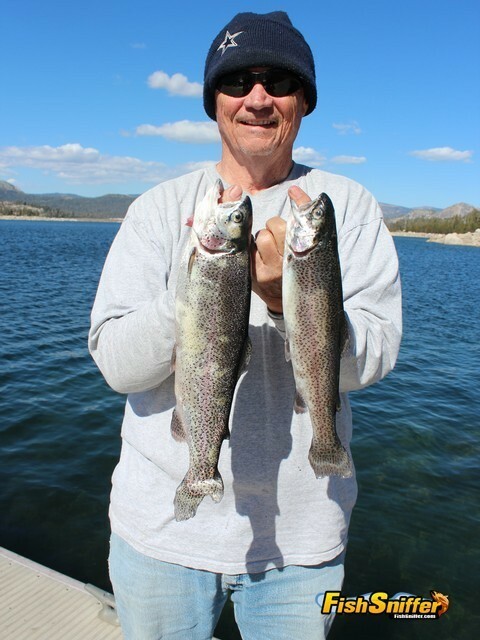 Loon Lake, situated in the Crystal Basin of El Dorado County, has been known in the angling community for decades as a pristine location for trollers and bank anglers to catch large numbers of holdover and planted rainbow trout. The conifer-lined alpine lake, silhouetted by the snow-graced peaks of the Crystal Range, is in my opinion the most beautiful of all of SMUD’s Crystal Basin lakes. Not only is Loon Lake scenic, but the future of trout fishing at Loon Lake is now even brighter, due to a new trout planting program that was initiated in 2015. 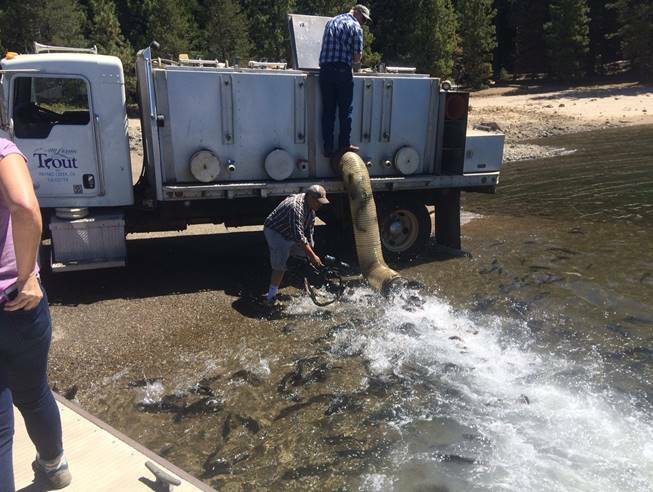 SMUD, in conjunction with the California Department of Fish and Wildlife (CDFW), this June, July and August stocked Loon Lake, Ice House and Union reservoirs in El Dorado County with a total of over 25,000 pounds of rainbow trout this summer. These stocked trout are one to two pounds each and in a few years could be potential trophy fish. The amount of fish stocked can number as high as 50,000 pounds in a given year, depending on matched stocking by the California Department of Fish and Wildlife. This is the fourth consecutive summer SMUD and CDFW have combined efforts to stock the reservoirs. “The trout planting is intended to enhance angling opportunities for the public, According to surveys, fishing tops the reasons folks visit the Crystal Basin Recreation Area. 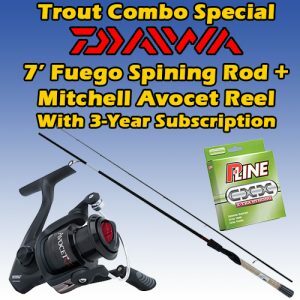 On average, the stocked trout weigh one to two pounds each, with a handful of trophy fish included,” according to SMUD. SMUD coordinated six separate trout plantings from June through August. Loon Lake received 6,250 pounds, ending up with 1,000 pounds on August 13, the last scheduled plant of the season. Union Valley, the largest of the three reservoirs, received 10,000 pounds and Ice House, 8,750 pounds. The fish provided by SMUD came from Mount Lassen Trout Farms of Payne’s Creek. The company also stocks SMUD’s Rancho Seco Lake that ever annually hosts the very popular Trout Derby. This year SMUD is working with the owners of the Ice House Resort to install a board where anglers can post pictures of their catch from Crystal Basin reservoirs. The “Crystal Basin Bragging Board” offers anglers the opportunity to show off a photo of any catch they think is worthy. A scale will be made available as well if anglers wish to weigh their catch and claim biggest fish bragging rights. “SMUD proactively works to improve the quality of life in El Dorado County, where many SMUD employees call home and work, and where the electric utility owns and operates the Upper American River Project (UARP), a system of hydroelectric generation facilities,” according to SMUD. In 2014, SMUD was awarded a new 50-year license by the Federal Energy Regulatory Commission (FERC) to continue operating the UARP, which provides nearly 700 megawatts of low-cost, clean, non-carbon-emitting hydro power, enough to provide about 15 to 20 percent of SMUD’s energy capacity during an average year. The fish-stocking effort helps SMUD meet conditions of operating its FERC license for the UARP. 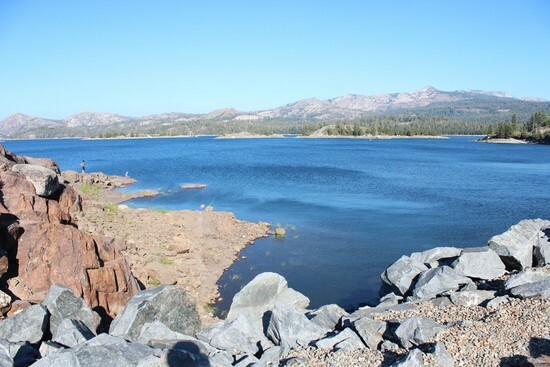 Located an elevation of 6358 feet 45 miles northwest of Placerville at the edge of the Desolation Valley Wilderness Area, the 76,200 acre-feet Loon Lake is formed by Loon Lake Dam, completed in 1963 by Sacramento Municipal Utility District (SMUD). The lake, designed to conserve spring snowmelt runoff for use during the summer and autumn for hydroelectric power production, is part of SMUD’s Upper American River Project. Loon Lake Dam impounds water at the headwaters of Gerle Creek that, prior to the dam, flowed intermittently through Loon and Pleasant Lakes, both natural lakes. However, most of the water now stored in Loon Lake Reservoir arrives from Buck Island Reservoir in the adjacent Rubicon River watershed by way of the Buck-Loon Tunnel. 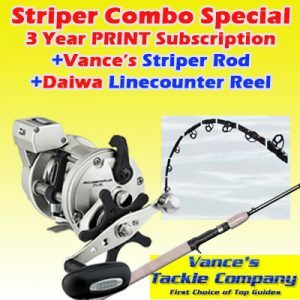 I first fished Loon in the summer of 2000, when I landed a limit of gorgeous rainbows while trolling Cripplures with Dale Daneman of Dale’s Foothill Fishing. The second was a bank fishing adventure at the reservoir in the summer of 2011 where I again landed a limit of rainbow trout. Rick Grimmett of Citrus Heights was trolling the lake with his grandson, 7-year-old Gus that day and gushed about the solid fishing available at the lake. That day, I also saw two other anglers in a boat traveling right near the ramp. I asked them if they had seen any shore fishermen catching fish on the lake. After thanking the angler for the tip, I drove over to the parking area near the structure, the intake to a tunnel to Union Valley Reservoir. I quickly caught my limit of rainbows, including one beautiful square tailed holdover, while employing orange and yellow Power Bait. On my most recent trip. I again fished that spot during the late afternoon and found trout success once again while fishing one rod with PowerBait and the other rod with various spoons and spinner. Fishing pressure was very light; there were only two boats on the lake when I arrived. I ended up being the only fisherman on the lake after those anglers in two boats left. There are few things better than catching trout in total solitude on a gorgeous reservoir right next to the Desolation Valley Wilderness Area. One of the great things about fishing Loon is that there are other superb fishing opportunities nearby. You can fish for planted brown and rainbow trout at Icehouse Reservoir or you can target mackinaws, kokanee salmon, rainbows and smallmouth bass at Union Valley Lake. Gerle Creek Reservoir also features a wild brown fishery. The CDFW historically stocked 9,000 rainbows in Loon, 6,000 rainbows per year in Union Valley and around 10,000 rainbows in Ice House, but these numbers have been increased, due to the agreement between SMUD and CDFW. Stafford Lehr, now Chief of the CDFW Inland Fisheries Branch, played an instrumental role in negotiating an agreement that provides both doubling of the current numbers of trout planted at the Crystal Basin reservoirs and enhanced stream flows for native species. For more information about UARP and associated projects as well as current reservoir and stream release conditions, please visit smud.org and the Community and Recreational Areas Web pages. Hard-fighting rainbows like these two are the reward for boaters and bank anglers fishing at Loon Lake. History: In 1957, SMUD began construction of the Upper American River Project (UARP), a series of hydroelectric power plants in the Crystal Basin. As part of this project, SMUD created a network of beautiful mountain reservoirs. Through careful planning with the Forest Service, SMUD built a variety of recreational facilities around the reservoirs. Spanning 85,000 acres of pine and fir forests and traversed by lakes, reservoirs and streams, Crystal Basin offers a diverse range of exciting outdoor adventure. Working together, SMUD and the Forest Service continue to provide land- and water-based recreation opportunities for all visitors to enjoy. Camping: More than 700 developed campsites are available, each with a fire ring and grate, table and parking space. Piped water, trash containers and toilets are available at most campgrounds. Most sites require fees and reservations. Fishing: Anglers can target rainbow and brown trout at Loon Lake, rainbow and brown trout at Ice House Reservoir, smallmouth bass, mackinaw, kokanee salmon, German brown or rainbow trout in Union Valley Reservoir and wild brown trout in Gerle Creek Reservoir. Boating: All of the lakes have boat ramp access. 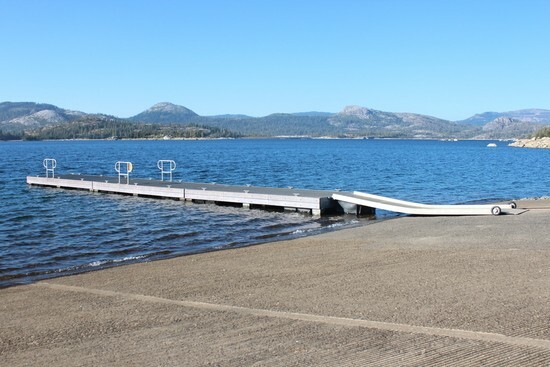 Loon Lake, Ice House Reservoir, Union Valley Reservoir have paved boat ramps and are large enough to accommodate motor boats. The lakes are large and provide ample space for manuvering. Fishing Guide Services: Contact Dale Dale Daneman, Dale’s Foothill Fishing Guide Service , (530) 295-0488, www.dalesfoothillfishing.com. Hiking: Hikers can access more than 117 miles of trails across the Sierra Nevada. Many offer easy to moderate day hikes. Loon Lake Chalet: Skier, hikers and mountain bikers can take refuge in this year-round chalet offering a large warming room, small kitchen and sleeping accommodations for 20. Wheelchair access: Many of the developed areas throughout the Basin are accessible for people with disabilities. The fishing pier at Gerle Creek, several of the parking areas, and the paved boat ramps at the reservoirs accommodate wheelchairs. More information: For reservations or more information about the availability of recreational facilities at the El Dorado National Forest, call 530-644-2349. For maps, brochures and other information, got to: http://www.smud.org/en/about/Pages/recreation-crystal.aspx/ Call You can also call SMUD at 1-888-742.7683 for a Crystal Basin Recreation Area brochure and map. Boaters are able to launch their boats with ease at the Loon Lake boat ramp.